Last month, we asked a group of artists Has a surprising or unusual locale ever proven a boon to your art-making? 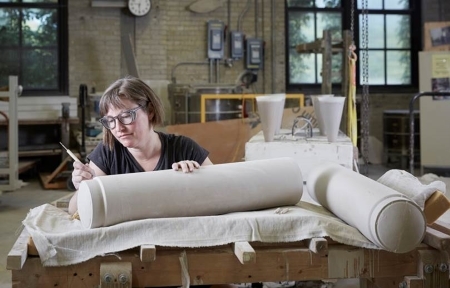 Here, sculptor Christy Georg addresses the same topic, having recently returned home from a surprising locale herself: the Kohler industrial factory in Wisconsin. The risks and strides I’ve taken within my art practice have taught me to completely believe in my ideas and in my ability to achieve difficult, interesting goals. Thoroughness conceptually, as well as with materials and process in the studio are a defining factor of what makes being an artist essential to me. Endurance and perseverance are evident in both the subject and the practice of my art career. Nineteen artist residencies have taken me to interesting and highly influential places over the years which allowed my ideas to grow in ways never conceivable in the limit of what a “home” might provide. 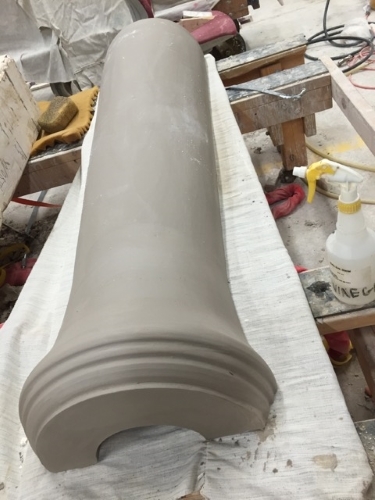 And so for for 13 weeks this year I found myself beginning production on a new body of work in the pottery factory at Kohler Company in Wisconsin. “Don’t be too disappointed if the project proves impossible,” I was told. There is no more delicious prize in the world than successfully achieving a nearly-impossible goal, and I enjoyed pushing myself mentally and physically to produce such a complicate, physically large, and multi-part project. The Arts/Industry Program places two artists in studios alongside normal factory production in both the pottery and the foundry. Watching the three shifts of workers coming and going kept my appetite for production crazy high. The pottery casting facility is kept hot and humid for the clay, but the taxing environment just made me want to be tough enough to overcome it. 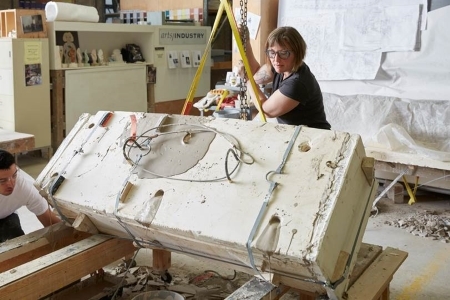 I made sixteen multi-part plaster molds, which overflowed the studio and had to be well engineered to I could manipulate them alone with the help of a hoist. 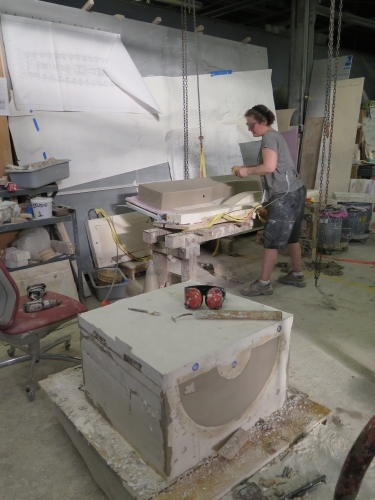 Slip-casting the vitreous china is also very physical and I felt like my movements became choreographed over my sweaty and very long work days; a machine in the factory engaged in nearly 24-hour production, and with an unusually high rate of success. Christy Georg is a sculptor whose numerous honors include a Lighton International Artists Exchange Program Grant and a Mass Cultural Council Finalist award in Sculpture/Installation/New Genres. She teaches sculpture at Santa Fe Community College and is also an Adventure Guide for both Santa Fe Mountain Adventures and Santa Fe Walkabouts. 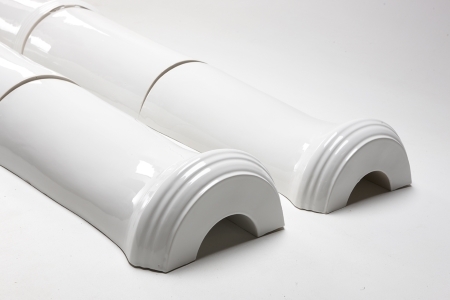 Images: all images from Christy Georg’s work-in-progress GREAT GUNS, a recreation of the armament of the main gundeck of the USS Constitution in slip-cast porcelain. Work created in Arts/Industry, a long-term residency program of the John Michael Kohler Arts Center in Sheboygan, Wisconsin. Arts/Industry takes place at Kohler Co. 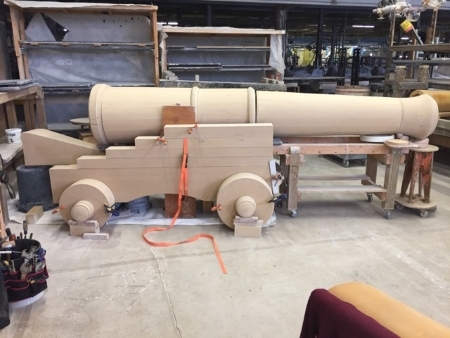 I saw your cannons and liked them very much what’s next?